It is not uncommon to have songs in iTunes that are missing artwork and track information. 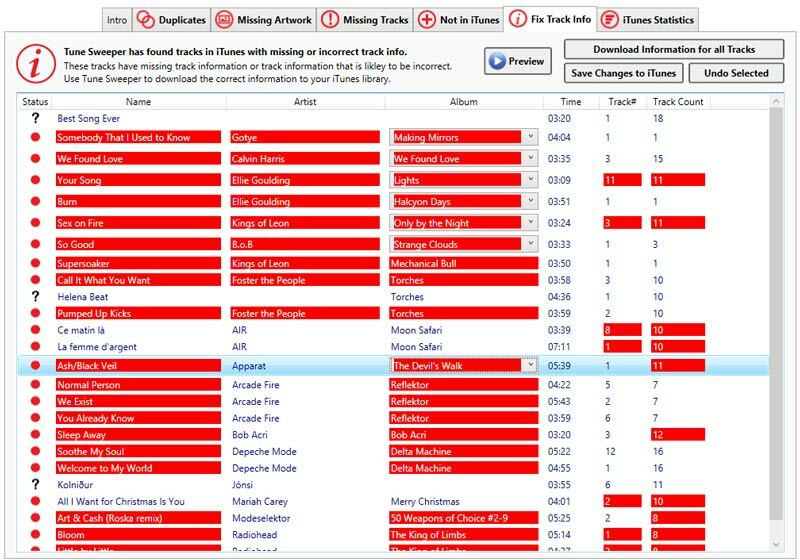 This can make it harder to identify tracks and perform sorting to find tracks quicker. Fortunately, an iTunes fixer tool like Tune Sweeper can help find and fix nameless and incorrectly named music tracks in iTunes. It uses advanced digital fingerprinting to identify tracks with missing or incorrect information from a database of over 35 million music items. Once identified, Tune Sweeper will obtain the correct song data which can then be saved directly to your music files. If multiple matches for track are found, you can select the best match that you prefer. With Tune Sweeper, you will never have to deal with unknown artists, albums or track names again! Discover how to quickly fix iTunes track information using our easy-to-follow Tune Sweeper user guide.